The nesting season for the world’s most endangered sea turtle, and official sea turtle of Texas, begins amid fears that it may be facing a decline after a rally that lasted more than a decade and had federal officials ready to take it off the endangered species list. The turtle’s primary nesting grounds are in the Mexican state of Tamaulipas and in South Texas, which has more nests than any other U.S. Gulf state. Counting nests during the April-August nesting season is the only way scientists have of gauging the Kemp’s ridley population. Projections made last year showed that the turtle is once again on the path to extinction after exponential gains that abruptly ended in 2010, the year the worst oil spill in U.S. history soiled the Gulf of Mexico. The Deepwater Horizon spill dumped an estimated 4.1 million barrels of oil into the Gulf, much of it polluting Kemp’s ridley feeding grounds and saturating floating islands of seaweed where newly hatched turtles make their home. The scientist who plotted the most recent downward trajectory for Kemp’s ridley is hoping as well for a resurgence this nesting season. “I think we will be looking for the rebound because we are hoping that the decline is temporary,” said Selina Heppell, associate professor at Oregon University’s Fisheries and Wildlife department. Heppell said a resurgence in the number of nests would mean that there are a large number of juveniles remaining from the years prior to the oilspill who are now maturing and able to nest. “What it would indicate is that the impact, if there was one (from the oilspill), was a short-term impact and what we are seeing is that there were plenty of turtles out there, which is what we were hoping,” she said. The turtle’s decline came as funding seemed to be drying up for efforts to study and save the Kemp’s ridley. U.S. Fish and Wildlife announced last year that it was halting the $150,000 it had been giving each year to the Mexico/U.S. 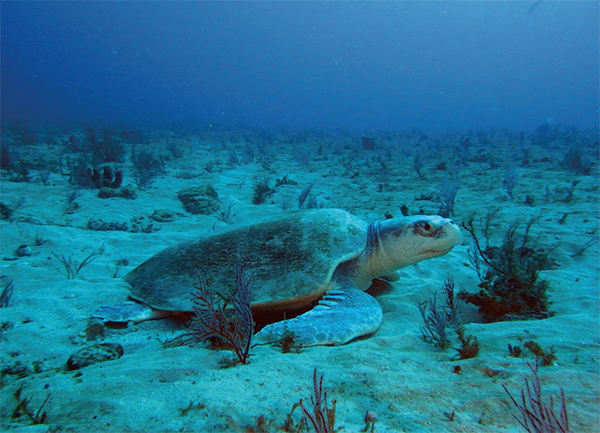 Binational Kemp’s Ridley Sea Turtle Population Restoration Program. Likewise, a program for tracking turtle nests on the upper Texas Gulf Coast has failed for the last two years to find the $70,000 to $100,000 it needs. The non-profit Turtle Island Restoration Network stepped in last year, setting up a full-time office in Galveston and helping train and organize 120 volunteers for turtle patrols. Joanie Steinhaus, Turtle Island associate director and Galveston representative, schedules the volunteers, answers phones and rushes to newly discovered turtle nests along with Reich and other Texas A&M scientists. “It’s great what we are doing, but we could be doing more,” Steinhaus said. Money to finance the operation of ATVs would enable the patrolling of long stretches on the Bolivar Peninsula and Galveston Island, she said. Without funding, Reich said, scientists are forced to forgo research such as tagging turtles with monitors that are tracked by satellite, analyzing tissue samples as well as hiring students to do work for which volunteers may not be available. All that could change once Texas Parks and Wildlife distributes a $45 million grant for Kemp’s ridleys from BP announced in April by the Deepwater Horizon oil spill Natural Resource Damage Assessment Trustees. “This is the biggest thing that has ever happened for Kemp’s ridley turtles, hands down,” said Pamela Plotkin, associate research professor at Texas A&M University at College Station. Plotkin, who helped organize a symposium last year on the danger to turtles, said she was on a conference call with Parks and Wildlife officials about how the money would be distributed. Parks and Wildlife officials could not be reached for comment, but Plotkin said the money will be aimed at increasing the number of nests in Mexico and Texas, increasing paid staff and training, building cabins and adding two nesting corrals on Padre Island, increasing the number of observers on fishing boats equipped with turtle excluder devices, training for fishermen and increased enforcement. Public hearings will be held on the plan before it takes effect, she said. So far this year the number of turtle nests found is promising, said Donna Shaver, division chief of Sea Turtle Science and Recovery at Padre Island National Seashore and a major figure in Kemp’s ridley research. All nests found in Texas are reported to Shaver and the eggs packed in boxes and sent to Padre Island to be incubated. As of Thursday 53 turtle nests had been counted on the Texas Coast, two of them on the Bolivar Peninsula, one on Galveston Island and one at Surfside Beach. “Right now it looks like it might be better than last year,” Shaver said, “But it’s still too early in the season.” Last year 92 nests were found, down from 118 the previous year. In Mexico, where nests are counted in the thousands, a large number of turtles arrived to nest over the last few weeks, a nesting wave known as an arribada, Heppell said. Reich said that the nesting should start peaking over the next two weeks and taper off after the middle of June. “We hope this year will end up better than last year,” Shaver said.